With issue #47, prepare for a visit from the ghosts of resin past as the AFM crew unearths a special American GK Classics issue! Relive the hobby's golden era with vintage kits that helped shape the resin figure market's early formative years. Featured models include Jeff Yagher's "Curse of the Werewolf", The Barker Bros." "Jersey Devil," GeoMetric Design's "Pumpkinhead," Janus Co.'s "White Zombie" and many more landmark kits. The AFM artist profile also goes retro with a spotlight on sculptor Mike Parks and his innovative work with Mad Lab Models, plus the AFM Gallery will line up a retrospective look back at numerous producers and their famous kits. 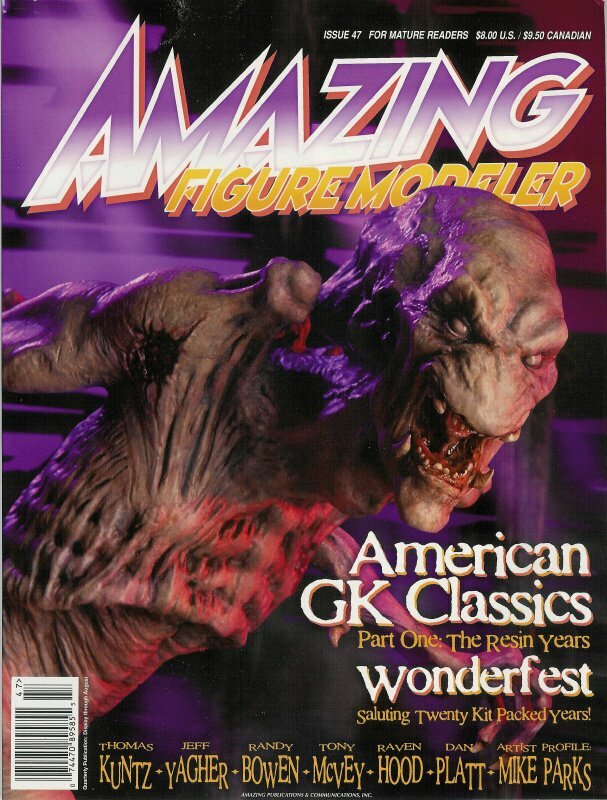 All this along with news, reviews and so much more await modelers in issue number 47 of Amazing Figure Modeler Magazine! A letter from AFM Editor Terry J. Webb. Steve gets back to the hobby's roots with Robert Kurtzman and American G.K.'s first original designed model kit. Watch Fred do that voodoo that Janus Company and Thomas Kuntz do so well! Peace-nik Rick is Raven about Hood's classic midnight movie icon! Larry nets Randy Bowen's heavily sought after galactic hunter. George takes a look back at over twenty years of history with our hobby's greatest modeling convention, Wonderfest! David does a diorama do-over with Jeff Yagher's first Garage Kit! Jason summons everyone's favorite revenge-seeking demon from GEOmetric Design and Randy Bowen. Terry explores the chemistry of Mad Lab Models" not-so-evil genius, Mike Parks! Jason wanders through the pines of New Jersey and comes face to face with The Barker Brothers mythic resin Devil! Dan proves two heads are better than one with Tony McVey's double-trouble dragon!